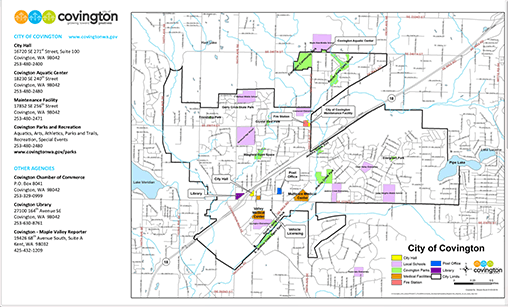 The gateway to southeastern King County, Covington is rich with engaged citizens, new young families, good schools, quality businesses, strong leaders and safe neighborhoods – all key in making it a wonderful place to live. Set in an idyllic Northwest landscape just 40 minutes out of Seattle, Covington offers small community attributes with big city amenities. In Covington’s growing downtown, well-known restaurants like Applebee’s and Red Robin, and retailers like Costco, Home Depot, Fred Meyer, Walmart, and Kohl’s thrive alongside many locally owned, long-time Covington businesses. From its location in southeast King County at the intersection of Hwy 18 and SR 516, the urban attractions of Seattle, Bellevue, and Tacoma, as well as recreational opportunities like skiing, hiking, and camping are just a short drive away. Covington’s growing park system and award-winning aquatics center offer activities for all ages. Family-friendly events include the Covington Days Festival, on the third weekend in July, KidsFest in August, the Covington Summer Concert Series, and the Covington Community Tree Lighting Event the first Saturday in December. 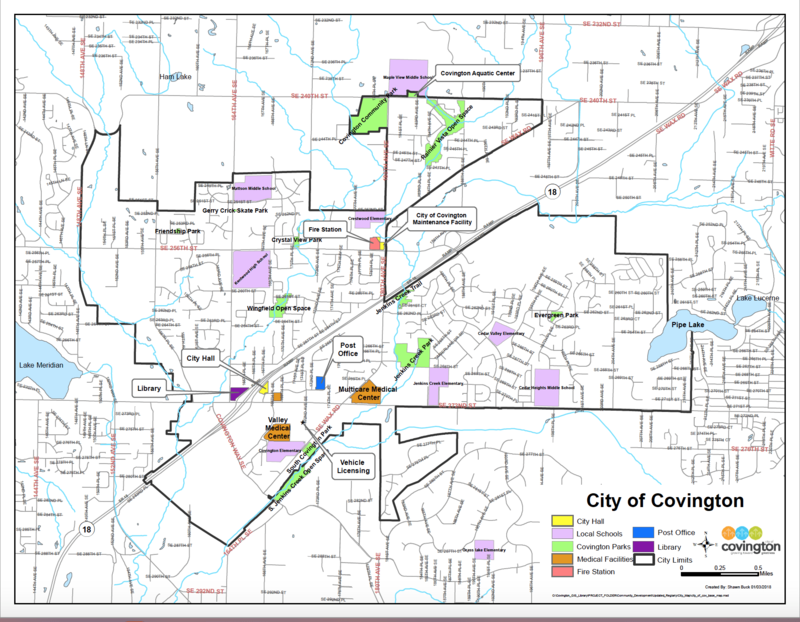 Interested in a City map of Covington, WA? Download a PDF here or Click on the image and download the PDF.